It’s a curse, and it’s my salvation. If not for my obsession with organization, I’d have free time. You see, I organize all my time into writing projects. I have queues for every phase of writing, in different formats. I’ll never be bored. Yet, it keeps me on track, gives me choices when I really don’t feel like working on one project or another. My tool is a notebook, a personal size one that fits into my (probably too large) purse (give me a break, I’m a Mom, I need a big one). 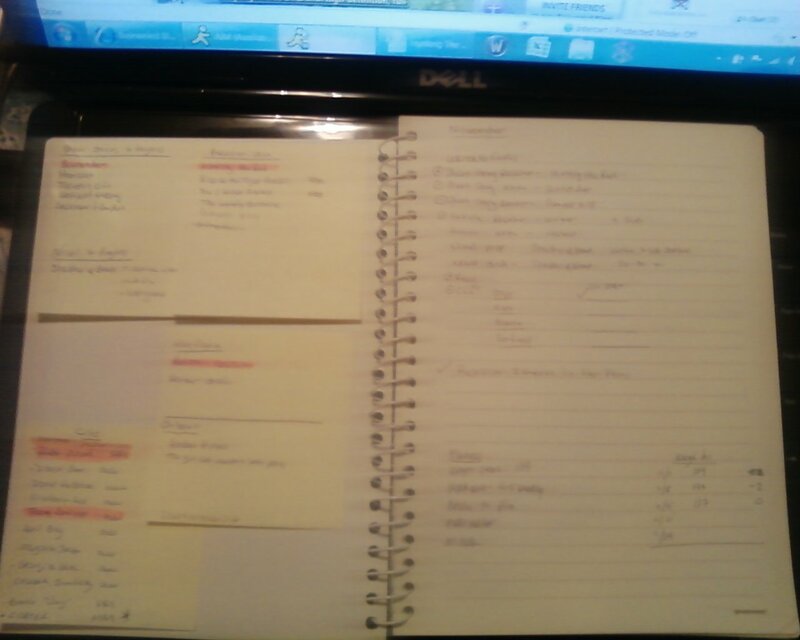 Here’s how I put all my projects into one “at a glance” salad of post its and notes. The left side lists everything in queue, theoretically about six months worth of work. Let’s go clockwise, shall we? The first post it is “Short Stories in Progress” and “Novels In Progress”. I have five short stories in various phases of planning, outlining, writing, and simmering. The main project is highlighted. Below these, I have my current novel project and the phases I need to work on. The key for me is I have my plan for the month (listed on the right side, the rule sheet, and when I sit down to write, if I can’t or don’t feel like working on one project, I work on something else from my list. Sure, sometimes that means a project that’s troubling me might not get done for a while, but there’s an upside to this: I’m still producing. I don’t get writer’s block. I don’t always work on what I’d hoped for on the first of the month, but that’s okay. Based on my productivity, these post-its get rewritten every two months. I can rotate the ignored projects to the top of the list. That actually helps because if I’m consistently ignoring something, the post-it’s trigger that recognition and I cn dig into why I don’t want to work on it. That’s my insanity. What’s yours? How do you keep on track with your writing goals/activities? Umm, not too surprising, I have something similar, okay, several somethings. The difference is that I don’t actually pay attention to those lists as much :p.